Since my last post about the mimosa pudica flower blooming, I almost killed the poor thing with too much love (water). The plant looked a little wilted, so I saturated the soil and overnight all the lower leaves turned yellow and started dropping. I’ve since moved it up to the office, where it’s a degree or two warmer, hoping to dry out the soil. The upper leaves have not turned yellow yet. What happens with too much watering of this plant is that it suffocates the delicate roots. Luckily the plant started to recover (meaning the dying leaves died, but the top half pulled through). There were three more flower buds near the top of the plant, and two of them opened. So lovely! I kept an eye on the third bud, and last night I noticed that the stem of this final bud had elongated quite a bit, and I could see some of the pinkish hue. My gut told me that this baby was going to open overnight. 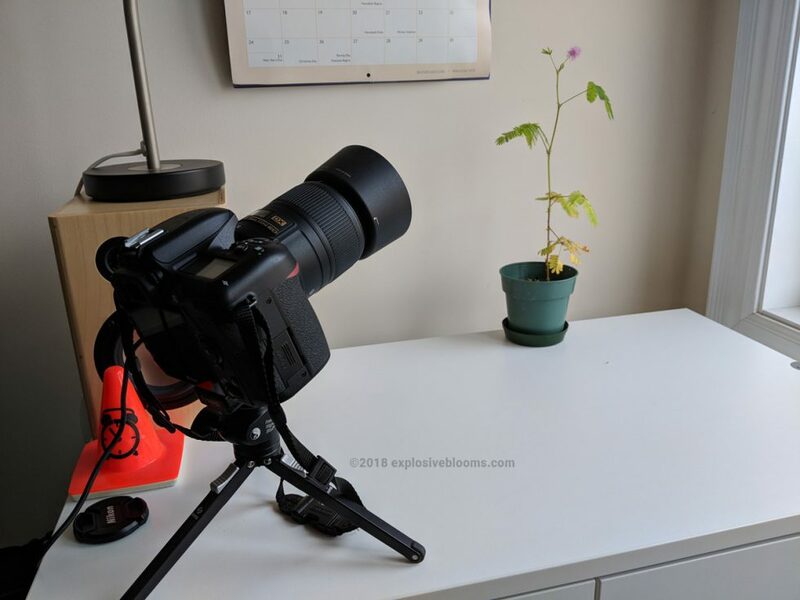 Hubs helped set up the camera and lighting, while I tried gathering some intel from the internet about when the flowers typically open and how long it takes. Surprisingly I couldn’t find a whole lot of information, but one person that took a video added some details that helped us make some decisions. The plant was placed by a west-facing window. We set the camera to begin shooting at 5:00 am, just as the sun should start rising. Photos were taken every 20 seconds until 10:00 am. Hubs was concerned that the camera battery would die, but it still had lots more juice left after 5 hours of shooting. You can imagine my excitement when I woke up at 7:00 am and ran into the office to see if it actually opened, and there it was. It wasn’t in its fully glory yet, but by 8:00 am it was starting to fill out. Hubs took the 872 photos and stitched them together to get this amazing “video” of miss sensitive’s flower opening up.